Discover the best of ancient and modern Shanghai on a full-day private tour. Relax in private transportation from your hotel to each stop on your itinerary. The immersive tour strikes the perfect balance of history and contemporary culture. Visits to Fuxing Park, the Bund, and Old Town give you a holistic understanding of the city. You also enjoy the freedom to interact with your guide for a more personalized experience. I have been to Shanghai many times on short business trips but when finally being able to see Shanghai with my family and a great guide like Qinqin makes for a great family bonding. 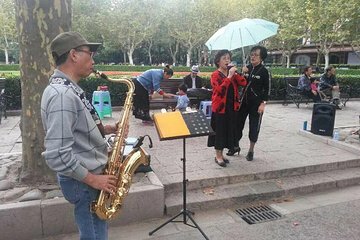 the schedule went smoothly and Qinqin delivered on the aspects of Shanghai which we wanted to see more of which was the french quarter and the range of artist studios in the area. The van was never far behind and was always conveniently accessible. Qinqin command of English greatly helped as well. The tour was great. Our guide Qinqin arrived on time. She was enthusiastic energetic very knowledgable and accommodating. We had a great vehicle.